New Disney Parks Exclusive Haunted Mansion Ezra with Doom Buggy Pop! Ride Coming Soon! Disney has released a photo of the upcoming Disney Parks Exclusive Haunted Mansion Ezra with Doom Buggy Pop! Ride via the @DisneySprings Instagram page. The new Pop! Ride will be released at Disneyland and Walt Disney World on Sept. 22. Below is a look at the upcoming Pop! Vinyl as well as the details of the release that was posted by Disney. View our newest release at your own risk—a wickedly rendered vinyl figure based on the hair-raising Haunted Mansion from Funko Pop! 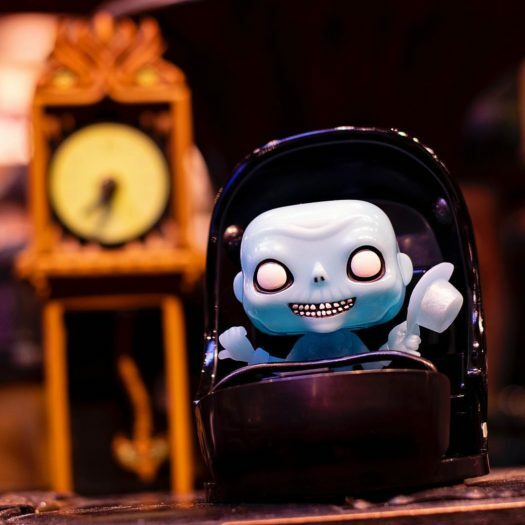 This exclusive art collectible depicts one of the grim and grinning ghosts hitching a ride on a Doom Buggy from the spirited attraction. Available while supplies last, this frightful figure can be purchased in various shops at Walt Disney World Resort and Disneyland Resort. Previous articlePreviews of the new Nutcracker and the Four Relms Pop! Vinyls!